If 12 good men and women can decide a murder trial, why can't a few hundred men or women run a country? Random democracy is true democracy with proportional representation by all groups. women, men, aged, youth, enthic minorities, etc. "The world needs to change"
Another one of my 'crazy' ideas is to replace politicians with ordinary people. 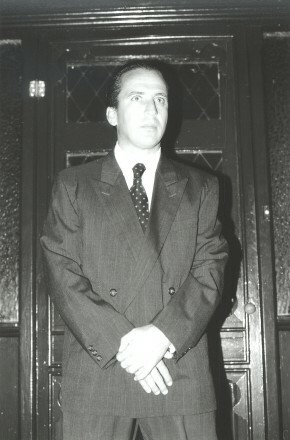 I first had the idea in 1985 but did not publish anything on it until the mid-1990's. With what is happening around the world at the moment, I am now pushing my idea again. Unbeknown to me at the time, my idea actually has its roots in ancient Greece, where democracy first started. When democracy started in ancient Greece (in Sparta), everyone, besides women and slaves, use to gather in a public place/hall to decide important issues. As the population grew, too large for everyone to attend, they adopted a system, where representatives were selected by a lottery system. This system has now evolved so that we vote for our representatives, but this system is highly politicised. Another problem with the electoral system, in Australia in this instance, is that effectively the only choice you have at elections is to vote for one of the main/two parties, and if you live in a safe seat, your vote is worthless. And furthermore, the Government is effectively decided in marginal seats by idiots and/or swinging voters. My idea is to random select say 1000 people to form the parliament and have this group continually changing, by replacing say 20 every month randomly (there is a good reason for this; see my papers). You may think that such a group could not possibly run a country, but from 1000 randomly selected people there will be around 20 people who will have direct experience in health and medicine (doctors, nurses, and health carers), and every facit of Australian life will be represented in such a system, and why shouldn't they be. Such a system would give power back to the people, and there would be no further need for elections (saving millions of dollars). In addition all the parliamentarians would be working together for the benefit of all. I surmise that such a system could work, and furthermore may lead to world peace, with all minority groups and women, for example, equally represented in the parliament. Andrew Ollie (the famous presenter from 4-Corners) interviewed me about my idea on radio 2UE and I got the distinct impression I was winning him over, after he had started with a very negative and skepical view about my idea. We spoke for about 30 minutes in the end. The problem with getting my idea out there, and off the ground, is that politicians will ignore it, or try to degrade it, or ridicule it, because they have a vested interest (power), and the media, which is very powerful in Western democarcies enjoy their symbiotic relationship with politicians. My idea is evolving and with some input from my son Daniel, I think we can get it going. Stay tuned. I have recently starting pushing the idea of random democracy as a solution to the current crisis in the world. I have written to the Secretary General of the United Nations, Mr Ban Ki-moon. Here is a copy of my letter dated 23 January 2012. No reply has been received. Maybe because the UN really has a vested interest in conflict. I am writing to you to tell you about an idea of mine that may have profound implications for world peace. At the moment the world is in turmoil with likely revolutions all around the globe. There is considerable unrest in the Middle East, Africa and Asia, and even in Western Democracies (here I am referring to the Occupy Movement). It is great that countries like Libya, Egypt, Yemen, and Iraq for example are know free from dictatorship but I do not think imposing a western style democracy on them will work. The problem is that a government is elected with a majority of just over 50% of the vote, and so close to 50% of the people are unhappy, and minority groups receive little or no representation. The other problem with these countries in the Middle East and in Africa is that some or most of the people are religiously fanatical or passionate, they carry guns, and are prepared to use them. Initiating such a system of government would of course be a difficult task, particularly trying to justify it to third world countries when we do not have the same system in our western democracy. Start by appointing the senate or upper house by random selection. That way the people would have a final voice in any decisions made by the government. An even better idea, suggested to me by my son Daniel Christos, is to start a non-political party in all these countries, including western democracies. The candidates of this random democracy party would be randomly chosen from the public. [Please note that if a member of the public does not want to be included in this process, they can decline, and the usual requirements of no criminal convictions, over 18/21 years of age, etc., apply.] I believe this party will receive enormous widespread support by people who feel they are disenfranchised in their current political system. By the way, I myself am disenfranchised in the Australian political system. I live in a 'safe' ALP seat and my vote counts for nothing. Unless you live in a marginal seat and you are a swinging voter, your vote in Australia does not really count. I would love to see the United nations start a non-political people's party in every country around to world. I would be happy to discuss this idea with you further, or to even give a talk at the United Nations assembly. I am passionate about my idea, and confident that it may lead to a much more peaceful world. 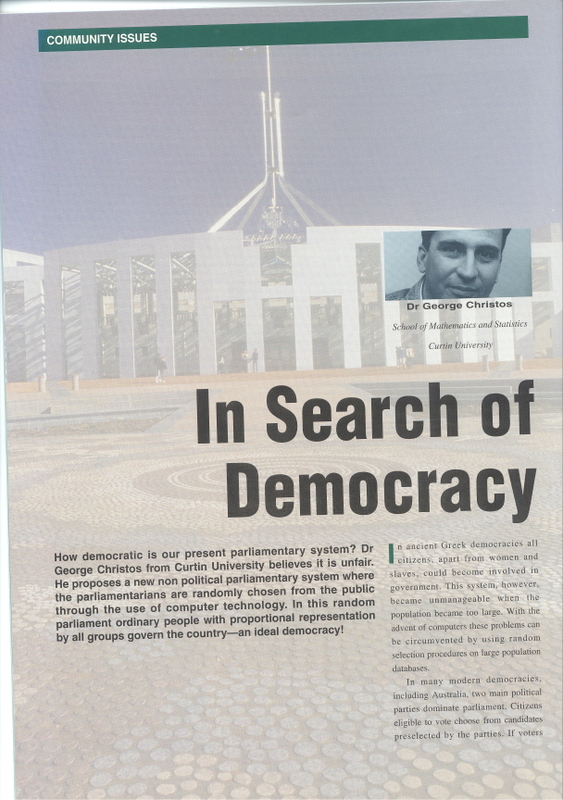 My ex-favourite ex-politician, Dr Geoff Gallop, while at ex-Curtin University in 1998, delivered a lecture on the need for politics. Small world actually (dropping a few more names), because Geoff lived in the same block of flats when I was at Oxford University. He was also doing his DPhil, in politics. 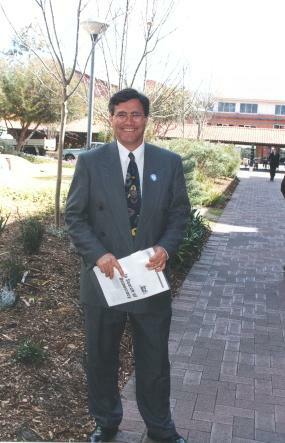 Geoff Gallop was the premier of our great State, Western Australia. Good on you Geoff! Just a minute. What has Geoff got in his hands? What is he pointing at? Click here for a close-up.